Rishi, who is in the US for medical treatment, is seen looking much better in the latest picture that was shared by his wife Neetu. 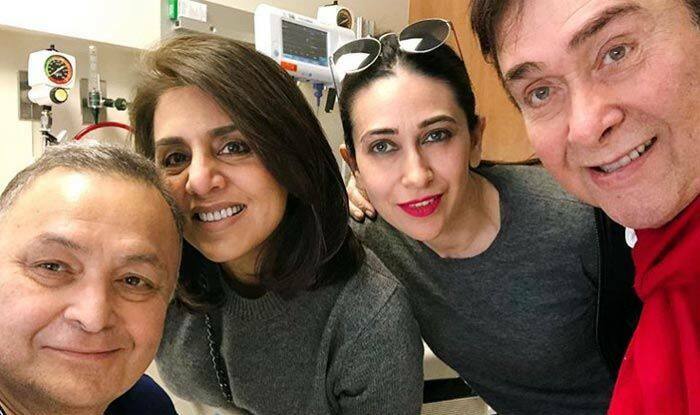 Veteran actor Rishi Kapoor has been in the US for medical treatment for quite some time now, and he has been visited by many of his colleagues from the film industry and by his family members too. The latest visitors he had were his brother and veteran actor Randhir Kapoor and his niece Karisma Kapoor. Rishi looked hale and hearty as he posed for a picture with them and his wife Neetu. Rishi had announced in September last year that he was leaving for the US for treatment, and since then he has been staying with Neetu in New York. His children, Ranbir Kapoor and Riddhima Kapoor Sahni, have been visiting him from time to time, and Neetu often keeps everyone updated about Rishi’s health through social media. After starring in numerous movies, Rishi was last seen in movie Rajma Chawal along with Anirudh Tanwar and Amyra Dastur. Directed by Leena Yadav and produced by Gulab Singh Tanwar and Aseem Bajaj, it had been released by Netflix on November 30, 2018.